We are delighted to announce the release of our Beaumont Joomla template. 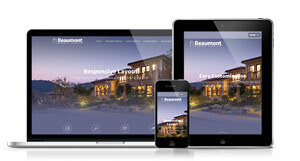 Beaumont boasts an elegant and clean template design providing a solid base for a wide array of websites. With it's strong header introduction Beaumont would sit perfectly in advertising any product from a luxury accommodation to a fine dining experience of a new restaurant. This template includes all the essential elements demonstrated on the demo including the beautiful GridGallery module, our much loved thumbs gallery module and the super easy to use icons module. With every template release we try to add something special and unique in to the design and we would like to think that this latest template release is no exception. The most important part of any website is the first screen on your homepage so with Beaumont we have ensured that you can easily create an enviting and stylish introduction to your site in a matter of mintutes. From within your templates parameters quickly select some eye catching images demonstrating your product to have them displayed in a sleek rotating header slideshow. This slideshow can then be easily used as the background to place some well choosen phrases about your site using the carousel module included with the template. Another stand out feature includes a fixed header to accommodate your logo and main menu. This ensures that your website name and main navigation is always in view to your visitors without taking up to much of your page real estate. With any template it is important to have the means to easily craft your website styling to meet you or your clients needs. To allow this our Beaumont template includes a whole host of color and typography options for almost every element of your site. As with all Joomla51 templates you can quickly upload your own logo to display within the header directly from the templates parameters or simply fill in the appropriate fields to display a text based logo in the same area. It couldn't be easier! We have layout possibilities fully covered with 50+ module positions to choose from along with a host of layout options including customisable module widths and 6 possible side column position options relative to the main article/component area. All fully responsive to ensure you get the best viewing aross all possible devices. Elevate your brand today with Beaumont!